Gulp is a toolkit to automate tasks primarily in web development workflow. It can automate things like css/js minification, concatenation, etc. 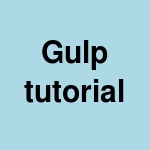 Here is quick tutorial to get started with gulp. Create these two files in proj1/src folder. // And create file1.js and file2.js in src folder. Initialize npm project (select project name as proj1) and create package.json. This will install packages in node_modules directory and update package.json to add gulp, gulp-contact, gulp-uglify, gulp-clean in devDependencies. Now run gulp again and look at the content of all.js again. This time it should be in compressed form. Change gulpfile.js to add clean-scripts task and also add it as dependency in scripts task. Now you can either run clean-scripts directly or run scripts task and it will run clean-scripts automatically. This can be useful in automating setting up build environment.